New Ring Pouch design where the ring does not show. I have created a simple pattern to make an Anglo-Saxon Ring pouch. I have worn my pouch for years, probably more than a decade. I love it, even though the lining has sun faded and I have had to resew the ring to the pouch three times. 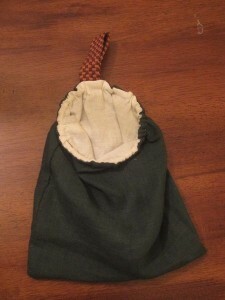 Years ago I wrote a class on the Ring Pouch. 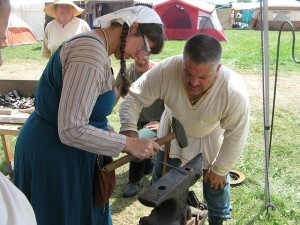 I regularly teach the class at Pennsic. I have had requests to teach the class in several other Kingdoms and a lovely lady translated my class into French. Sometimes folk send me pictures of the class or rewrite my handout and send a copy. Brown Ring Pouch on my hip. 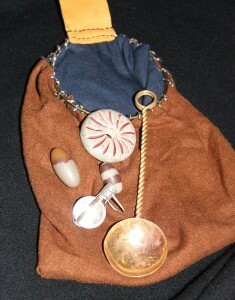 When I teach the Anglo-Saxon Ring Pouch class I use as many materials as I can that are period. The fabric is linen, as is the sewing thread. I bring my period iron and ironing board and offer the use of handmade needles. If you can sew the whole pouch with a period needle that I have made you may keep the needle. (I could be a better needle maker, so you earn that needle. Two people have gotten a free needle.) 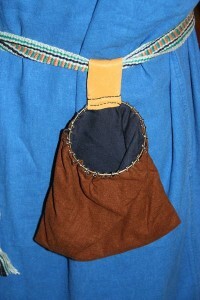 When I walk through Pennsic people regularly show me a hip with a Ring Pouch.